Companies are very customer-focused, committed to solving all of their customer’s needs and doing everything they possibly can to keep them satisfied. This approach (Mass Customization) insures that companies retain a highly satisfied clientele, as well as these get a high rate of repeat business and get referrals. Nowadays, consumers enjoys of a high purchasing power so that they are more prone to express their personality by ways of individual products/services choice. Companies such as Adidas, Puma, and Nike and so on have the ability to develop new products and services that closely match their customer’s needs. By following a systematic process to create personalized products, these companies are meeting customer’s expectations, desires and needs better that their competitors. As a result companies are working towards customizing offerings while still mass-producing them. Indeed, companies are implementing mass customization strategies to gain a competitive advantage. I believe that mass customization grants a lot of advantages for business. For instance, companies are able to get a faster ROI since customers frequently pay in advance and products are made-to-order. Companies are also able to provide quality services, achieve greater levels of customer loyalty and satisfaction, reduce inventory levels as well as collect information on market and industry trends. The latest foray into customization is called “Puma Factory”, and lets you choose the colors on three iconic Puma shoe models. You start from one of six pre-configurations, and the configurator is user-friendly and 3D, certainly more robust than Mongolian BBQ was. I decided to go to the website and design my own, these are my impressions about becoming a designer. 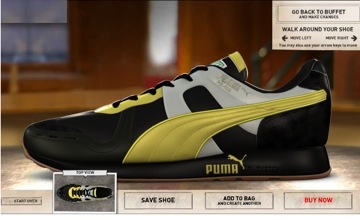 While I was designing my shoe, I felt a close interaction between PUMA and myself. For a moment, I though that I was the co-designer. I also felt that my feedback was taking into consideration which made me feel special and unique. The sense of DIY (Do it yourself) gave me such a sentiment of empowerment that I felt comfortable and satisfied with the process and the final result. I would buy my design without even thinking it. Regarding price point, my “DE” design has a suggested retail price of $130 USD. Such price can be considered to be slightly above average in comparison to an in-line (standard) product. For instance, a pair of similar running shoes at the Bay is priced at $ 125 cnd. After having designed my own shoes, I feel that PUMA has offered me the opportunity to create unique pair of shoes which comply in terms of fit, function and design with my personal requirements. So here it is my design – judge by yourself . Do I have a future in the design industry or I should keep writing?